Jacquelyn Gleisner and Ryan Paxton’s POD. Leah Andelsmith Photos. On Saturday morning, a black void popped up in Westville. A square box the size of a chalkboard framed and contained it. At its edges, paper pyramids in bright colors and cheerful patterns that also looked like sharp teeth. Not threatening, but enough to make you wonder: If you passed through the latticed archway at the entrance, would you make it out again? 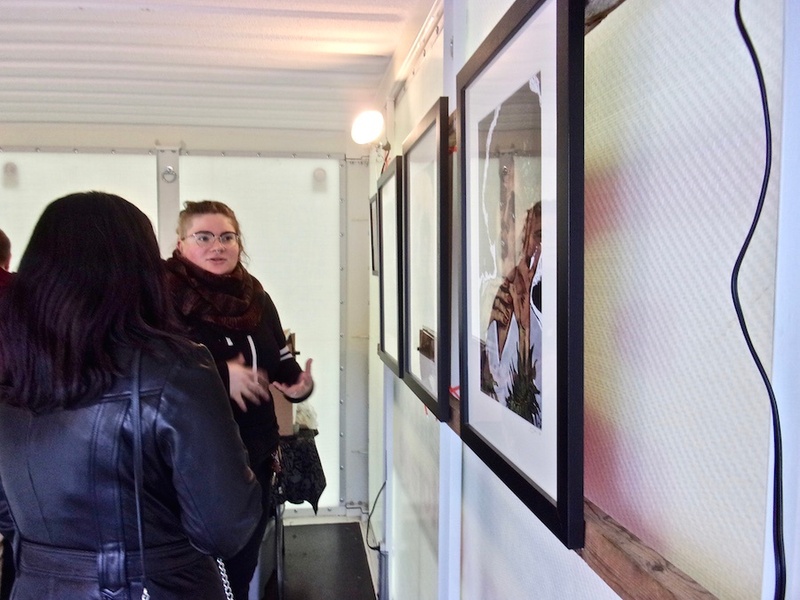 That void set the tone for Jacquelyn Gleisner and Ryan Paxton’s POD, one of six to pop up during City-Wide Open Studios’ (CWOS) “Westville Weekend” Saturday. 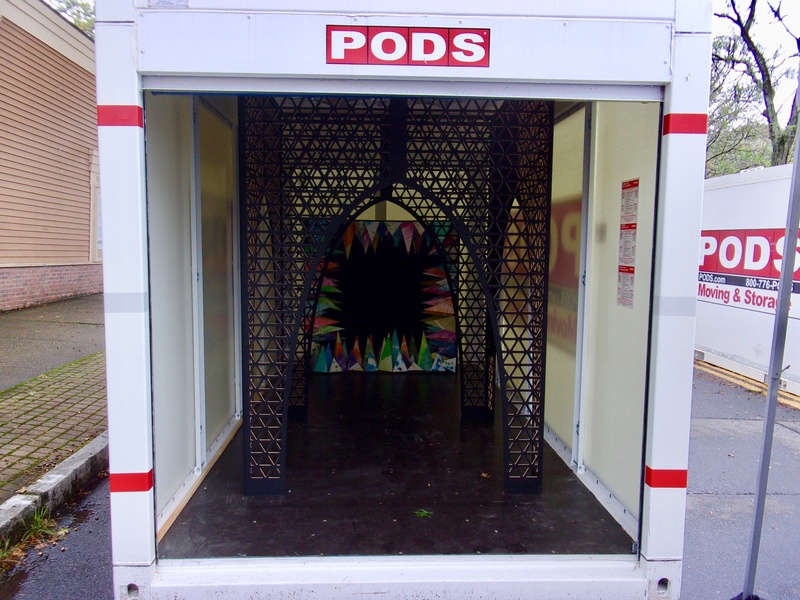 For the third year in a row, Artspace New Haven invited local artists to transform the neighborhood with immersive, public artwork, this time turning six PODS, or Portable On Demand Storage units, into temporary galleries. 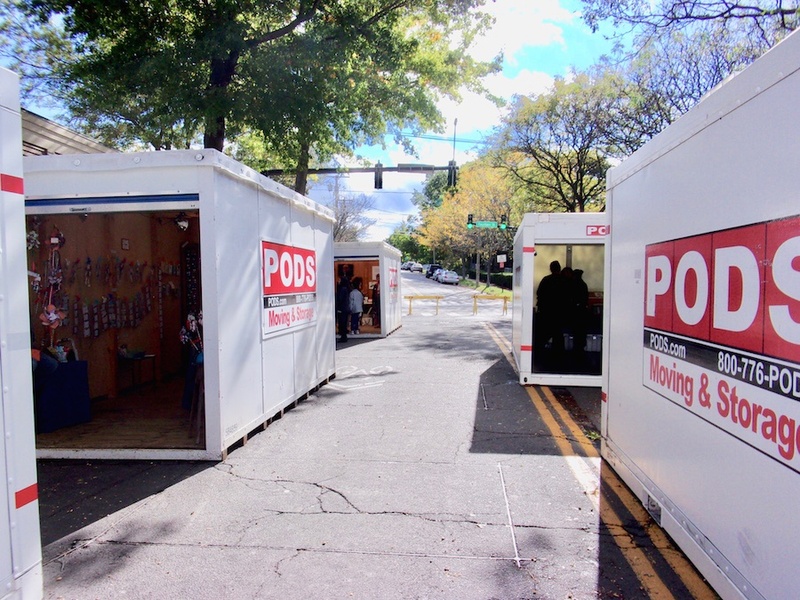 The event was sponsored by Portable On Demand Storage with support from Artspace New Haven and the Westville Village Renaissance Alliance (WVRA). Unlike the labyrinthine halls of Erector Square at the beginning of the month, the Artist PODS in Westville offered dozens of attendees a smaller spoonful of CWOS. For one chilly afternoon, the block of Central Avenue between Fountain and Whalley was a cozy alleyway home to six tiny worlds. Gleisner and Paxton filled their POD-world with a single installation titled Chamber, which examined the human need for beauty and order in a chaotic world. In the POD, the archway was placed strategically near the front to draw the viewer further in, leading them to a black box in the back. Within it danced colorful pyramids that Gleisner called “dangerous,” explaining she’d crafted them using paper she “cannibalized” from previous art projects. “You can’t get inside the black void, but it is alluring and enticing,” she said. Nearby, images from Colin Burke’s pinhole camera graced the wooden walls of his POD. In one, a wash of turquoise and periwinkle caught the eye. Upon closer examination, details emerged: rippling water in the middle of the composition, the trunks and bare branches of trees on either side, light and dark streaks in one corner. The streaks, Burke said, trace the seasonal path of the sun over a whole year. He captured them on sunny days, and the dark gaps were created on cloudy ones. To make this image, Burke sealed a sheet of photographic paper inside a coffee can opposite a tiny pinhole he made in the metal, essentially creating a camera. Then he left the camera on West Rock. The water that seeped into the vessel during that time left marks on the paper that added an extra dimension to the photograph, like peering through a gauzy curtain. Burke, with his camera to the left . “I hide it in the woods and hope it will still be there when I get back,” he said of the process. Photographs from his “officially sanctioned” cameras, left in protected places like the Goffe Street Armory, produce clearer images that are no less ghostly. Hamden artist Sara Zunda, who said she prefers “visually bold” images, lined one wall of her POD with vibrant portraits and the other with fantastical illustrations. Zunda has been making digital art since middle school and has been working as an illustrator and graphic designer since graduating from Paier College of Art last December. After showing art at last year’s CWOS Armory Weekend, she went on to live illustrate Toto Kisaku’s Requiem for an Electric Chair at the International Festival of Arts & Ideas in June. Those works—fantastical and fear-inducing figures with sharp edges and menacing faces—compose just part of her oeuvre. Artist Sarah Zunda with a viewer. “Otherwise, why would you do it?” she mused aloud. Some PODS were more political. In Sarah Schneiderman’s POD-world, viewers came face-to-face with collages made of found objects instead of new materials, and a table stacked with voter registration forms beside information on her artwork. 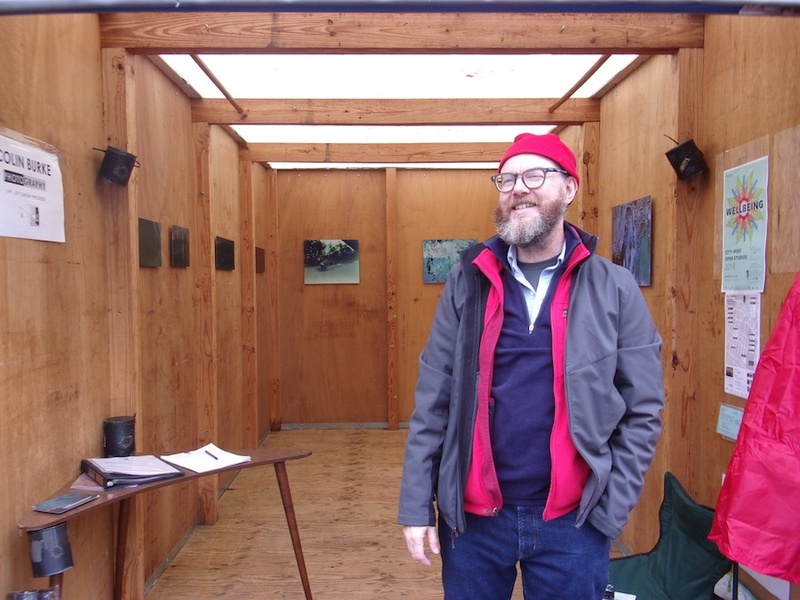 In the POD, Westville resident Mark Cicero moved in to pore over the work. “I’m going to dive a little deeper,” he told the artist. Though Schneiderman started out in 2013 creating images of the fish she’d seen SCUBA diving, her focus turned political after the 2016 election. “I felt devastated and I thought I could not just make fish,” she recalled. 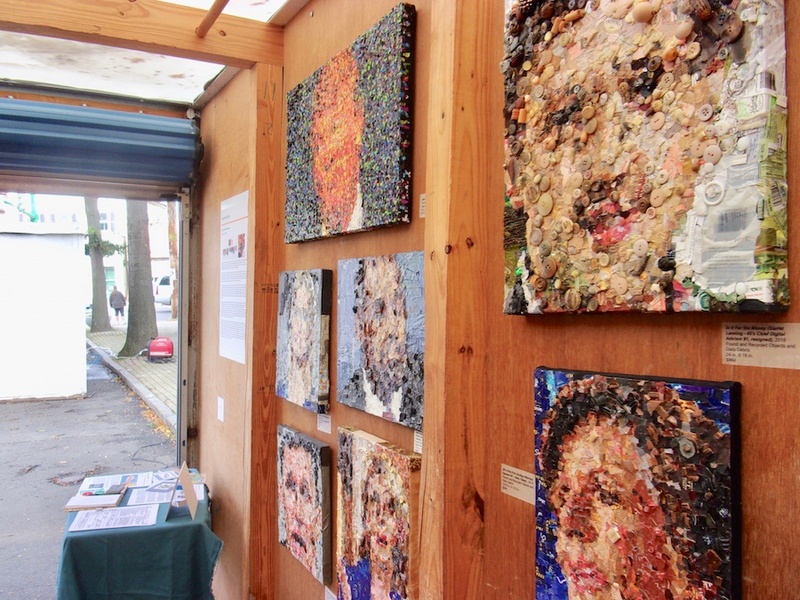 So she began making portraits of current and former members of the Trump administration, which she said she finds “very cathartic.” She suggested that by showing her pieces, she might have an impact on the political climate. As stories on climate change dominate the news, she said she has also noticed more people taking an interest in her work. One POD became a window into another city. Close to the entrance of the PODS installation, filmmaker Travis Carbonella used the white wall of the storage unit to screen his documentary of a mural-making project in Baños de Agua Santa, Ecuador. The film, called “The Volcán Tungurahua Mural Project,” follows New Haven artist Kwadwo Adae and a team of six artists and wellness practitioners on their journey to Fundación Arte del Mundo, an after school arts and literacy program in Baños de Agua Santa. Carbonella joined as the videographer, filming when he wasn’t helping out with the mural. The film highlighted the collaborative creative process and was the perfect complement to the PODS installation, showing how the New Haven art world has a reach beyond the Elm City. “What came out was a slice of life, a 24-minute picture of our time there,” Carbonella said. Janet Beth Brodie clipped her “paper people” to bright purple cord strung from each end of her POD. A cross between paper dolls and marionettes, each figure was a whimsical Frankenstein’s monster. One in particular sported an oversized, feathered hat, a striped tie, and one black and white boot. One of the legs was longer than the other to accommodate a rubber-stamped quote in rainbow ink. “Lack of charisma can be fatal,” it read. Stamped on one of the arms was the statement: “The life you ordered has arrived,” and on the other: “This is not art.” The paper face included wide eyes and curving lips and was stamped on with teal ink. Brodie said that she has been collecting stamps for over 20 years. The method works for her—she’s “not a draftsperson, so the stamps are a cool way to manipulate images,” she said. “My paper people have led me to cool places,” she said, citing an invitation to teach an arts therapy class at Smilow Cancer Center. 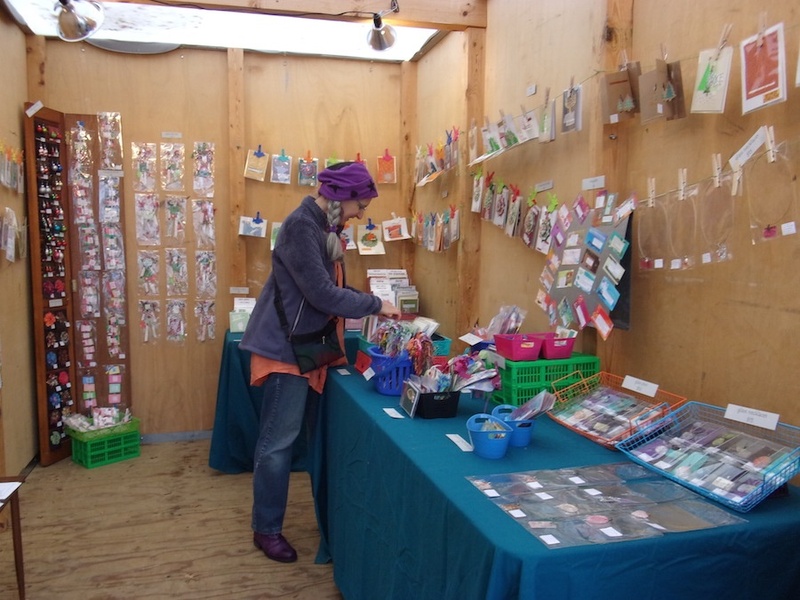 But Brodie also makes calendars, cards, and jewelry, all of which include the stamps and patterned papers that are her hallmark. Standing in the doorway of her POD, Brodie looked at the other galleries around her. If each POD were it’s own planet, she already had her telescope trained to the skies, watching other worlds to make sense of her place in Westville’s artistic solar system. “Each of the six of us have seen the POD in our own unique way,” she said. For more from Westville Weekend, check out the video from filmmaker Travis Carbonella, below.